Mathematics and mathematics education are of great significance in human pursuit of knowledge and truth. They are the foundation of science and technology. 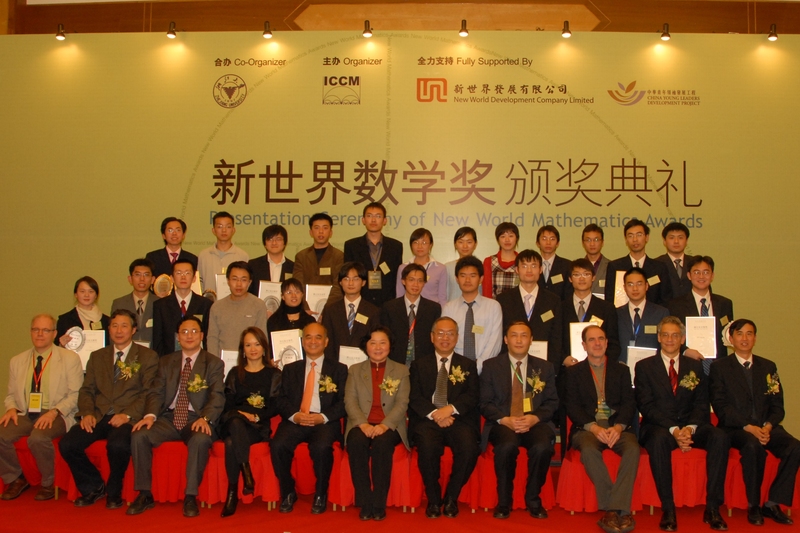 In 2007, Dr Henry Cheng, Managing Director of New World Development Company Limited and Professor Yau Shing-Tung, an outstanding mathematician, co-initiated the “New World Mathematics Awards" (NWMA). The goal of this program is to encourage outstanding Chinese mathematics students worldwide in their pursuit of mathematical truth. The NWMA 2009 is sponsored by the New World Development Company Limited and China Young Leaders Development Scheme, organized by the International Congress of Chinese Mathematicians (ICCM), co-organized by Tsinghua University and Zhejiang University. It is open for submission until October 30, 2009. Chinese undergraduate, master and PhD mathematics students from around the world who have completed or defended his/her thesis in 2008 and 2009 are qualified to participate. The topics of theses can be Pure or Applied Mathematics, Probability and Statistics, Biomathematics etc. Beginning in 2010, it is expected that the “New World Mathematics Awards" will be open for competition annually. The deadline for application has moved to October 30, 2009.